The Treaty of Versailles was the final peace treaty of World War I, which ended the war between Germany and the Allied forces. The treaty was signed June 28, 1919, more than six months after the final armistice of World War I, on November 11, 1918. Signed near Paris, in the Hall of Mirrors of the Palace de Versailles, the former palace of the French monarchy, the final treaty involved more than 5 months of arguments and discussions and hundreds of diplomats and politicians from Great Britain, France and the United States (the "Big Three"). World War II and the rise of Hitler are often viewed as consequences of the harsh terms and demanded war reparations included in this treaty. World War I troops in France. 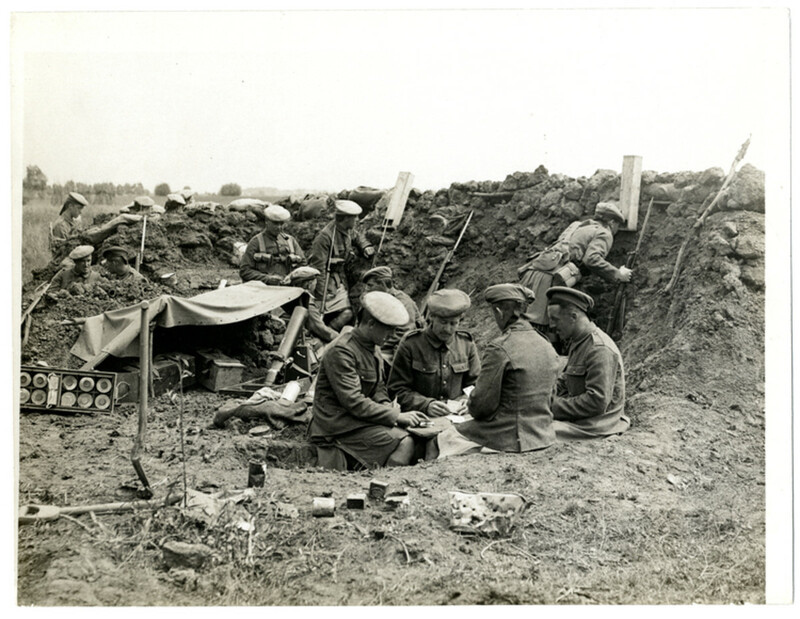 World War I (also known as the Great War and the War to End All Wars) spanned the years 1914-1918 and drew in more than 35 countries and two continents (Europe and Africa) before its final cease fire. It was the first "modern" war, involving for the first time, tanks, aircraft, chemical weapons and wireless communications. With horse-drawn cannons clashing with aerial bombardments and mustard gas fired on trenches of men, the casualties were astronomical. 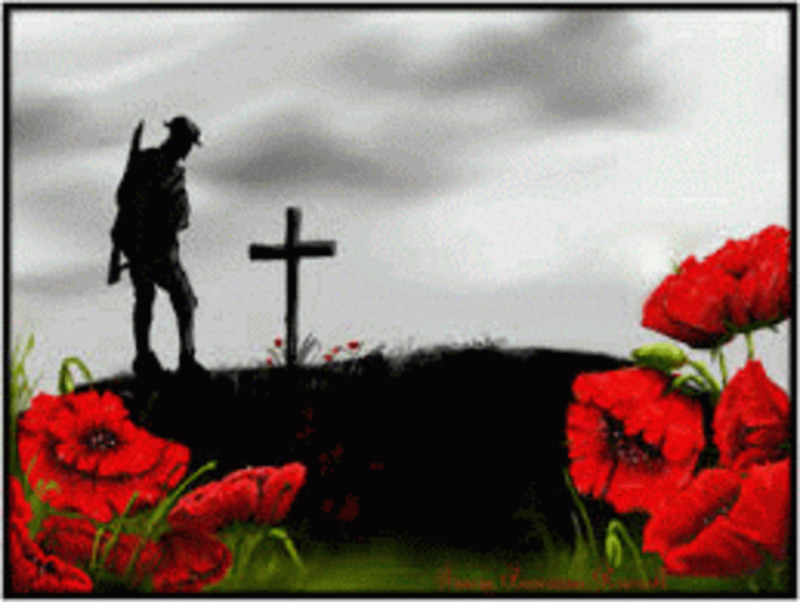 World War I remains the deadliest recorded war in world history. More than 16 million service personnel and civilians were killed and more than 21 million were injured. 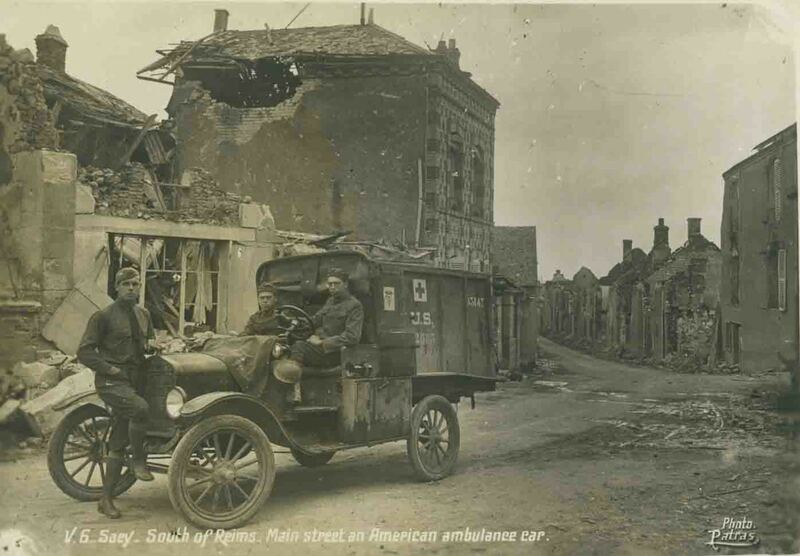 The First World War left Europe in shambles, with whole towns turned to rubble, portions of cities ruined and the countrysides pock marked and desolate. The young adults became known as the Lost Generation, referring to the percentage of young men killed, left disabled or permanently shell shocked. In addition to war casualties, the Spanish influenza killed another 25 million people during 1918, and the Russian Revolution of 1917 threw Russia into chaos and turmoil. 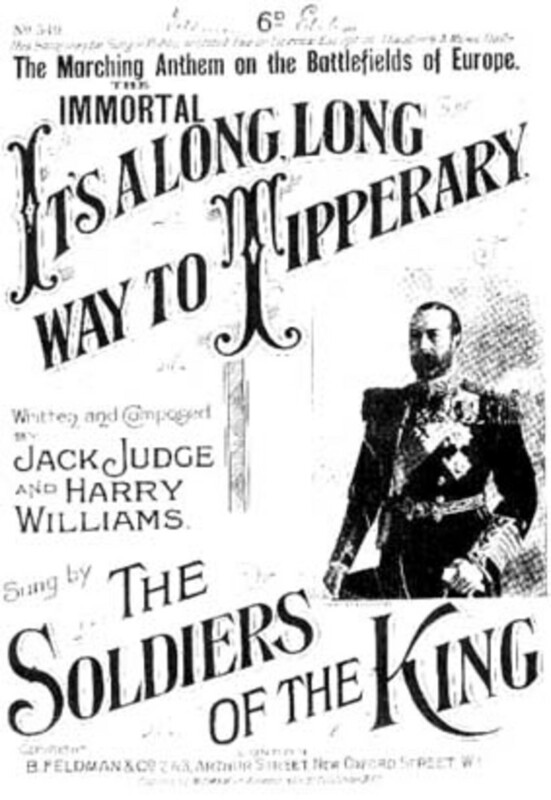 World War I, in effect, ushered out the Victorian Age and dramatically introduced the world to the 20th century. In this setting, an original 27 nations, including the Big Three, convened to hammer out terms which the Germans needed to accept to end the war. 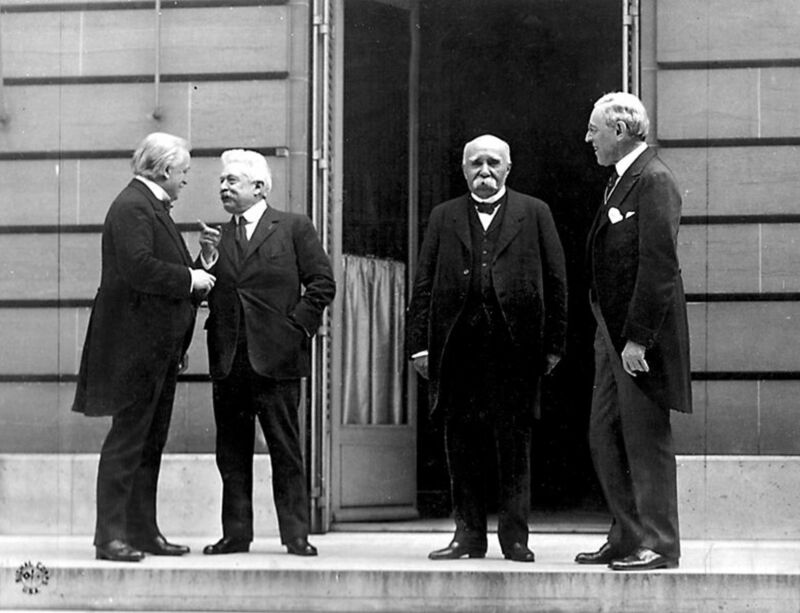 With took many cooks in the kitchen, the delegates were eventually weeded down to those representing the big three, whose political leaders at the time were David Lloyd George (Prime Minister, Great Britain), Woodrow Wilson (President, United States) and Georges Clemenceau (Prime Minister, France). In addition to representing all 27 countries in the Treaty negotiations, each of the Big Three countries had its own agenda, which led to months of arguments and deliberations. Wilson, an intellectual re-elected in 1916 with the slogan "He Kept Us Out of War", was personally shocked by the ability of modern civilizations to render so much death and destruction on each other. A peaceful man dedicated to education reform, he had a vision of world peace and freedom that he had published as his "Fourteen Points" in January 1918. Some of these points included worldwide membership in the League of Nations, the international reduction in arms and armed services, and the end of secret treaties. Because the U.S. had entered the war later and on a different continent, it had not suffered as great of losses as other Allied (or Entente) forces and was not as intent as other nations on the destruction of Germany. Wilson urged a treaty that would punish but not exact revenge, leading to eventual European reconciliation. Despite his integral part in the development of the League of Nations, Wilson also represented a nation that wanted no more to do with European wars and was instead interested in continuing an isolationist policy. 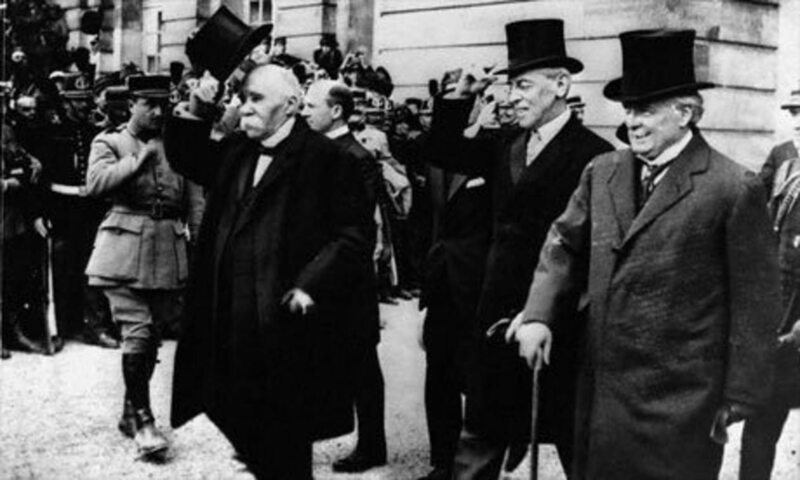 Clemenceau and France's delegates represented a nation destroyed by war. The leader and his citizens were of one mind: that Germany be severely punished for the war. 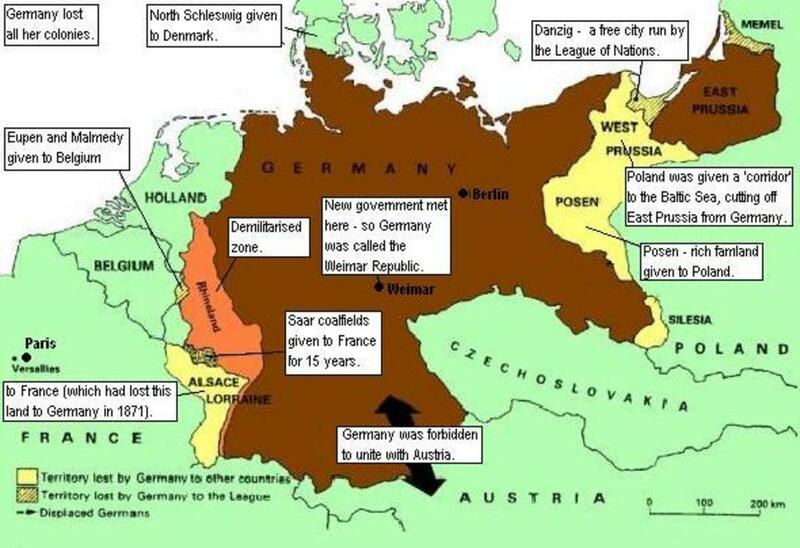 They pushed for a treaty that so stripped Germany of power that it could never start a war again. George, of a Britain, represented a people stunned by significant loss of life, although its lands were not ravaged like France's. George both wanted a punished Germany but was also looking ahead at the containment of communism and trade opportunities. As he and his delegation view the future, a totally impotent Germany would not be able to help contain communism to Russia, nor would it be a viable trade partner. 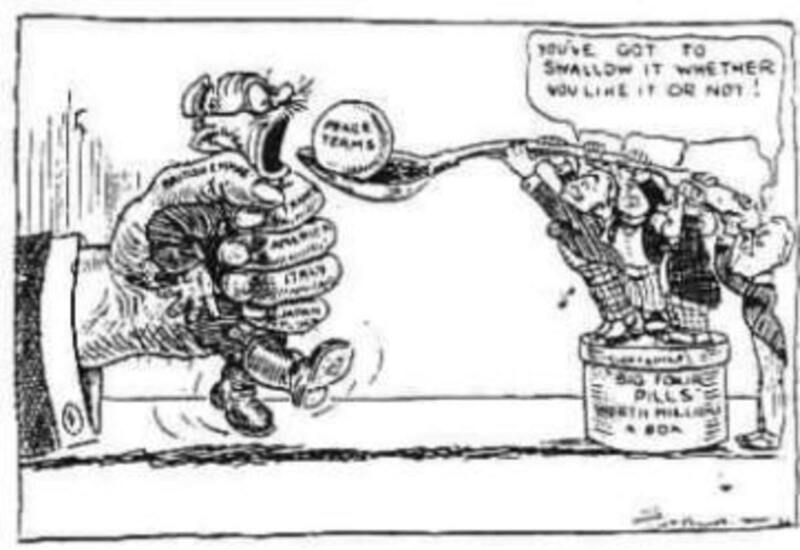 Treaty of Versailles political cartoon. The terms of the Treaty of Versailles were divided into legal, territorial, financial, military and general provisions. German War Guilt: Article 231 put all of the blame for the war on Germany and its allies, all of whom were to be help accountable for the all damage inflicted on the Allies and their populations. Germany's military was reduced to 100,000 men and conscription was ended. No tanks, armored cars, chemical gases or armed aircraft. Most of the treaty dealt with financial issues (War Reparations) related to Germany's responsibility for the war. The total sum for which Germany was held responsible was 226 billion Reichsmarks, which was reduced in 1921 to 132 billion Reichsmarks (about US$438 billion in 2010 dollars). Reparations were to be paid over 59 years (calculated from an 1871 treaty imposed on France by Germany, which was based on an 1807 treaty imposed on Prussia by Napoleon I). Part of these reparations were to be repaid through industrial product, including coal, steel, patent rights and agricultural yields. For instance, coal-bearing territories were transferred to France and Belgium in response to Germany's destruction of those countries' coal mines during the war. Other territories that remained under German control were ordered to deliver millions of tons of coal to the European allies for a period of years. According to the Daily Telegraph ("First World War officially ends "First World War officially ends" 2 October 2010), Germany made its final reparation payments in 2010. Finally, the Treaty of Versailles provided for the creation of the League of Nations and the International Labour Organization. Division of Germany and territories according to the Treaty of Versailles. Germany had two options: Sign the Treaty of Versailles or be invaded by Allied forces. Ratified by Great Britain, France and Italy, the treaty was not ratified by the U.S.
After all of Wilson's work, the U.S. Senate voted against ratification based on their reluctance to join the League of Nations. Defeated, Wilson suffered a permanently debilitating stroke and served out his term as an invalid. It wasn't until 1921, under President Warren Harding, that the Knox Porter Resolution was passed, formally ending the First World War for the United States. 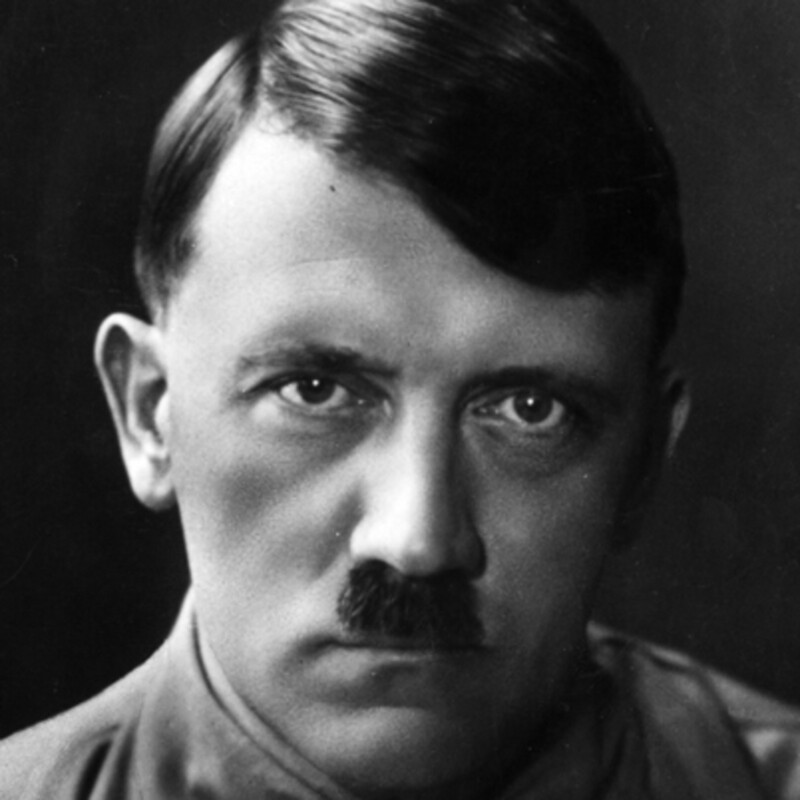 By punishing Germany so severely economically and not stripping its military powers completely, the Treaty of Versailles set the stage for Germany to allow such a lunatic as HItler to rise to power. Foch was correct. The German people despised the treaty and especially hated the German Guilt Clause. They believed the reparations to be unfair demands on a severely weakened industry and economy. As a result of the treaty, a string of violations began that ultimately led to World War II. Great article! Im doing and investigation on the topic for school and I would like to know which sources you used for writing this article! Great article-- and your map was terrific. If I remember, the Germans weren't allowed to attend until the last few days when they were told to sign or be invaded. Phdast7: Thanks for the positive feedback. I'm glad it was helpful to you. Blaba: The League of Nations gave the Saar coalfields over to French control for 15 years. So, in a way, the LoN was in control of Saar. Very well laid out information. I struggle every year with telling my students what they need to know about Versailles in the limited course time we have together. Very good maps and graphics. Thanks. Very informative and descriptive hub,thanks for sharing. A good topic... The description of Adolf Hitler as 'lunatic' is not true. He was a good orator and thinker... if you go by his book "Mein Kampf". For a country which was so badly restricted by the Treaty of Versailles, that man was very much needed. A badly mauled country was rearmed, its people rejuvenated and was able to annex all European countries in two years.. and could stay on the battlefield for six years... Six years to rearm Germany (1933-39)... Six years to fight a great war (1939-1945)! That was Hitler. His legacy is that the present dispensation of all world countries is due the great war started by him. 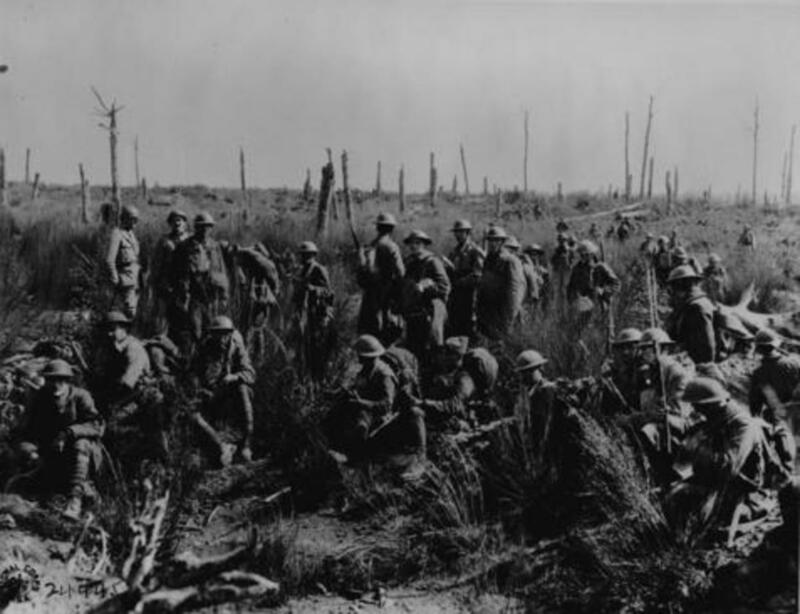 Madalaine: a really great source for Treaty of Versailles and other WWI information is firstworldwar.com. They offer a great deal of original source materials, including letters exchanged between the Allied leaders and the German delegation. The oppressive rules enacted under the Treaty of Versailles definitely played a huge role in Germany's transitioning into Fascist/Nazi state. Great Hub - love history. Rated up!